Slow Cooker Leek Soup is the perfect comfort soup, especially during colder weather. 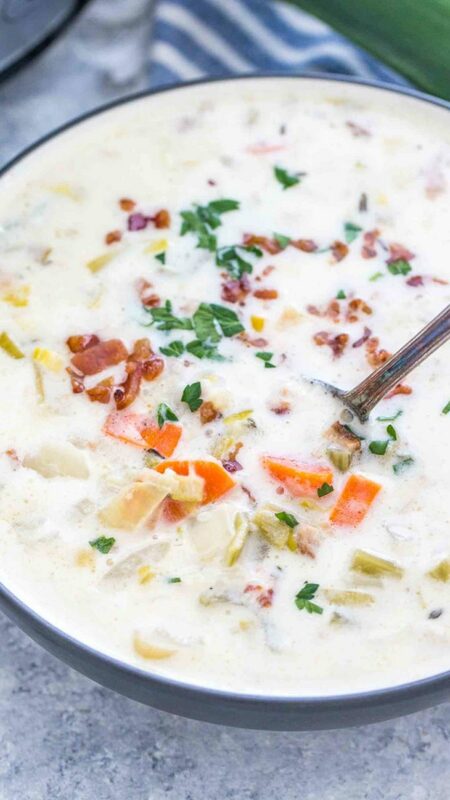 The soup is creamy, hearty and combines potatoes, leeks, bacon and broth. 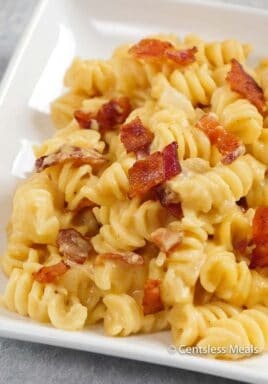 Easily made in the slow cooker for the whole family to enjoy! We love hearty and delicious soups made in the slow cooker. 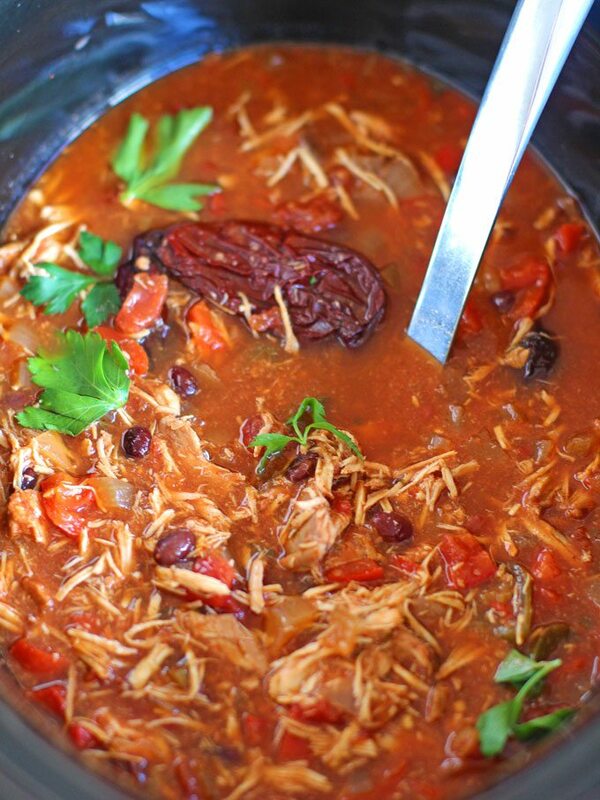 You can also check out the delicious Slow Cooker Chicken Wild Rice Soup and Slow Cooker Chicken Soup. 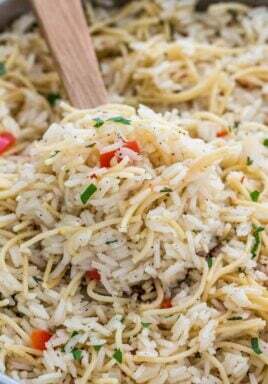 They are incredibly easy to make and full of flavor. Slow Cooker Leek Soup is flavorful, nutritious and pretty easy to make. This soup is a staple in our house, and every family member loves it. If you haven’t tried leeks before, this is a perfect opportunity to start and experiment its flavor. Leeks have the look of a green onion, but are large in size. They also taste pretty similar; however leeks have a milder flavor. Mixing leeks with potatoes in a soup is a winning combination. This leek soup calls for heavy cream to balance off the flavors nicely. It is what gives this soup a hearty and creamy texture. If you are short on heavy cream, you can use whole milk as well. The bacon is optional, but it add a deep smoky flavor that is absolutely beautiful. Are leeks good for you? Leeks are vegetables from the allium family. Other types of vegetables that are related to the leek are onions and garlic, as well as shallots, scallions and chives. While they resemble the green onion, leeks are larger in size. In addition, they have a milder flavor which makes them a perfect ingredient to many dishes. You can use leeks in salads, soups, or in sandwiches. They are full of vitamins and minerals. 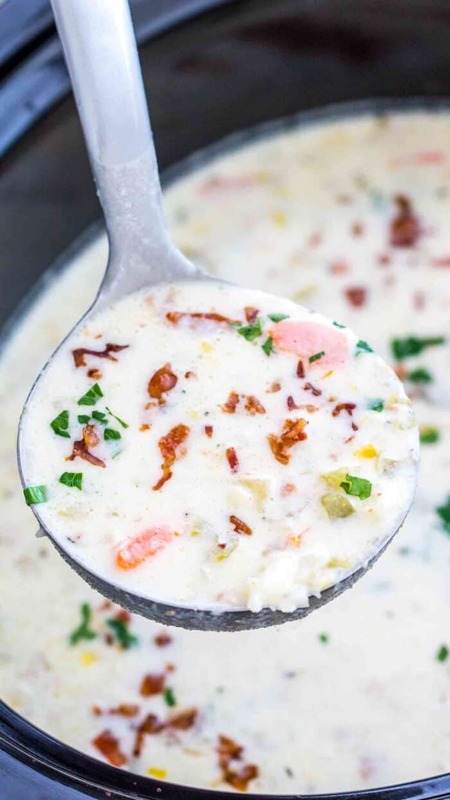 What kind of potatoes should I use in this potato leek soup recipe? We recommend using russet or yukon gold potatoes in this leek and potato soup because they have a high starch content. The starch helps the soup to thicken during cooking so they are ideal for creamy soups. If however you can’t find either of these potatoes in your store, you can use any other potatoes. This leek and potato soup will taste just as good either way! What is the best way to clean leeks? Start by slicing off the top dark green part, leaving only the white and light green part. This is the main part used in soup. Then, slice off the bottom where the root ends. It is usually dirty, so you want to avoid using this part in cooking. Next, slice the stalk lengthwise in half, and rinse under cold water. Cut in small cubic shaped sizes. How long does potato leek soup last in the fridge? To store the soup in the fridge, make sure it is completely cooled down. Then, transfer to a container that has a good seal. It is best to keep refrigerated for up to 3 days. Can I freeze leek and potato soup? Absolutely! It is best to freeze this potato leek soup before the cream is added because it will become soggy once frozen. Transfer the soup to an airtight container, and freeze it for up to 3 months. Defrost the soup in the refrigerator for 12 hours before serving. Then reheat it on the stovetop over medium heat for 10-15 minutes, or until hot. 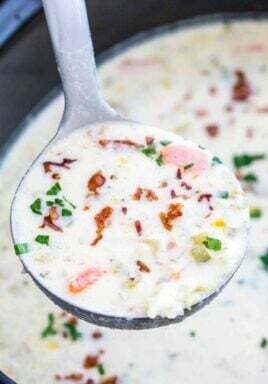 Once the soup is heated, add the heavy cream to it, and bring the soup to a simmer before serving. 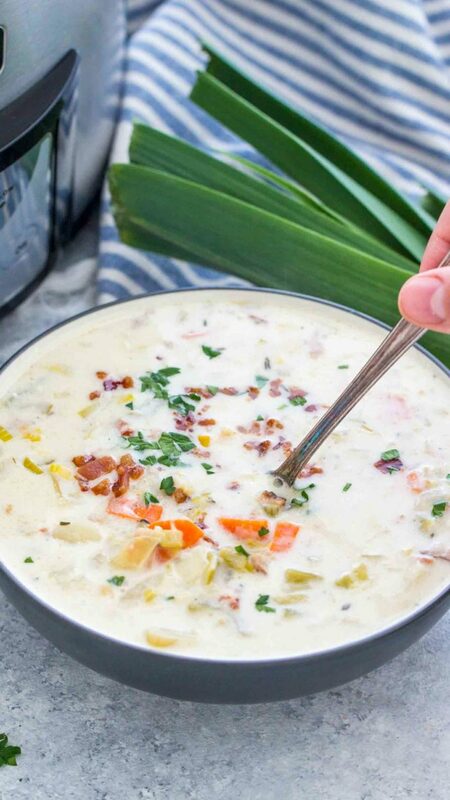 Enjoy making this delicious and creamy potato leek soup recipe! 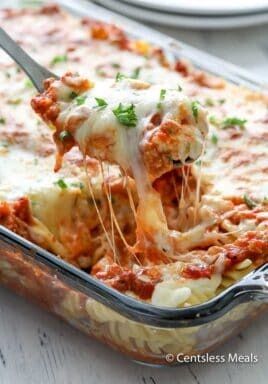 It is a heartwarming and home cooked delight that is comfort food at it’s best! More Soup Recipes to Enjoy! Slow Cooker Leek Soup is the perfect comfort soup, especially during colder weather. 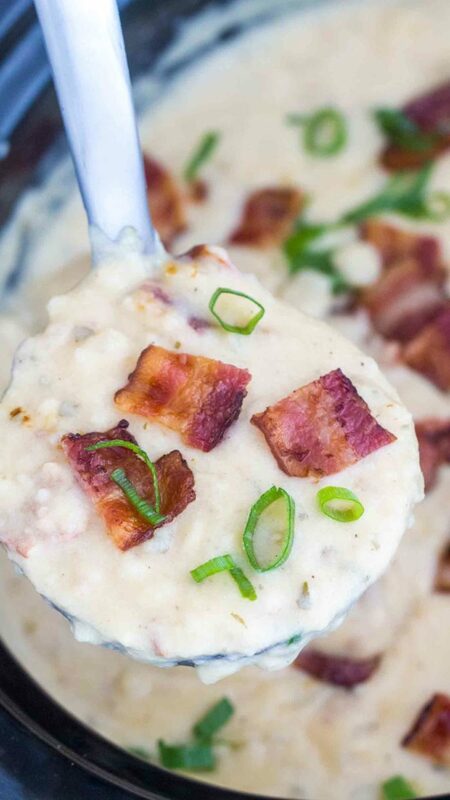 The soup is creamy, hearty and combines potatoes, leeks, bacon and broth. Clean, wash and chop leeks. Peel, wash and cube the potatoes. Prepare the rest of the veggies. 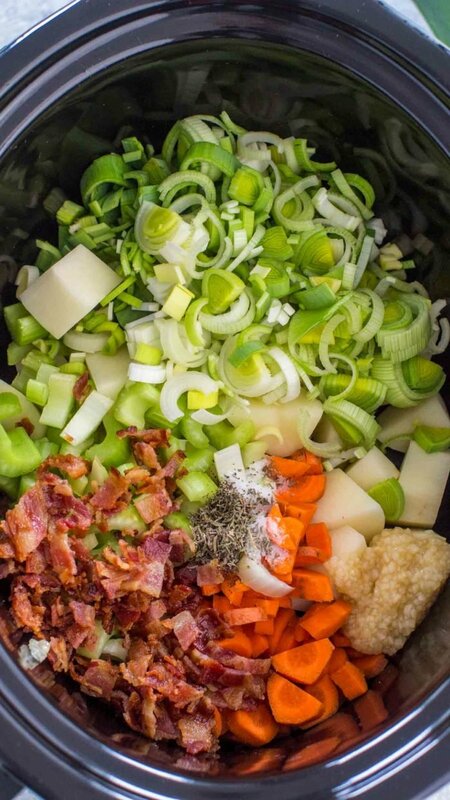 Add chopped bacon, chopped leeks, cubed potatoes, diced onion, chopped carrots, chopped celery and minced garlic to a 6qt slow cooker. Add seasoning: salt, pepper and thyme. Add broth. Stir to combine. Add cream and sour cream. Stir to combine. Use a potato masher, to mash some of the potatoes, still leaving some chunks for texture. Mix cornstarch with water until cornstarch is fully dissolved and add the mixture to the soup. Stir to combine. If the soup is too thick, add more cream or broth. Cover and cook for another 30 minutes on high.